In my last article, I looked at the stocks owned by Warren Buffett and Berkshire Hathaway and asked the question, “How Active is Buffett’s Portfolio?”. As we found out, the answer is very active in terms of how different the equity portfolio looks vs. the broader market index. The combination of Buffett’s portfolio and investing acumen has translated into one of the best investment track records in history. There are some interesting observations we can take from that track record and that’s where I will focus in this article. 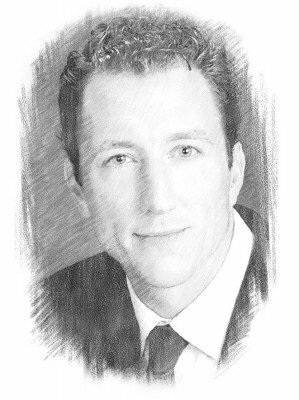 Patrick O’Shaughnessy wrote in one of my favorite pieces, Alpha or Assets, where he discussed the trade-offs between assets, alpha and active share. 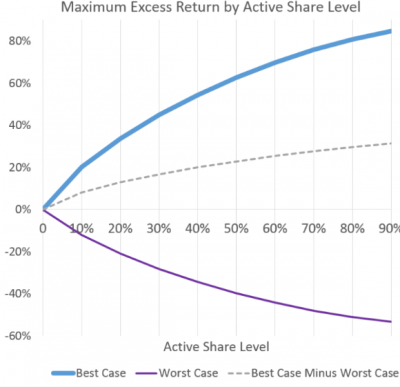 Active share is simply a measure that indicates how different a portfolio is from a market index. High active share in and of itself is not a panacea for market beating returns, but as O’Shaughnessy states in the article it is a “good indicator of any strategy’s potential alpha”. Assets tend to have an inverse correlation to alpha. Meaning, the larger the firm or strategy the harder it is to look different than the market, and therefore the harder it is to generate outperformance. So there is a constant tension between seeking alpha by looking different than the market and running a strategy more similar to the market that can scale as assets rise. The intersection of these things is what makes Buffett’s track record so incredible. There is a very good reason investors hang on the words of Buffett: his results. From 1965 through the end of 2018, Berkshire’s A shares have a compounded return of 20.6% vs. 9.7% for the S&P 500. In a paper published in the Financial Analysts Journal titled, “Buffett Alpha“, the authors compare Berkshire Hathaway to all stocks and mutual funds and they found the following: Berkshire has the highest Sharpe ratio (a measure of risk adjusted performance) out of any stock that has traded for 40 years going back to 1926. What’s more, Berkshire would also be the top rated mutual fund out of any mutual fund since 1976 using the Sharpe ratio. So not only has Berkshire delivered massive outperformance over the S&P, but it’s also superior when adjusted for risk. In an article published yesterday [Buffett’s Beta] from Morningstar’s John Rekenthaler, he discusses the findings outlined in the paper that helped uncover the sources of Buffett’s long term alpha. In Berkshire Hathaway’s annual letter to shareholders, page 2 shows the calendar year performance of Berkshire’s stock compared to the S&P 500 going back to 1965. The scatter chart above shows the years on the X axis and annual returns for Berkshire on the Y axis. Here are some things that jumped out at me when looking at the results. The stock produced an 80% return or more in 5 calendar years, 50% or more in 10 calendar years and 20% or more in 28 years. 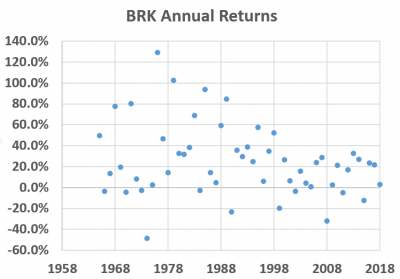 Most of the really big years came for Buffett in the 1970s and 1980s, and those returns impact on the long term results was significant. Potentially more impressive than the really big up years is that in 51% of all calendar years, Berkshire generated 20%+ upside. Berkshire has trailed the S&P 500 in 17 out of 54 years, so 31% of the time on a calendar year basis the stock has lagged the S&P. Those that think the stock has consistently outperformed year in and year out are mistaken. The median return for Berkshire from 1965-1991 was 31.8% a year, while the median return from 1992-2018 was 21.4%. This plays into the assets vs. alpha argument I discussed earlier. Clearly, Berkshire’s size has impacted the opportunity set and the results in the back half of Berkshire’s history. Given the size of Berkshire today (a $500 billion company with a $200 billion equity portfolio) the pure size of the firm is a limiting factor and Buffett has told investors not to expect returns in the future to come close to those in the past. There were only two years in which Berkshire lost money back to back. That was in the 1943-74 period. All other negative years were followed by positive performance in the subsequent year. In 1999, Berkshire trailed the market by 41% as technology and growth names dominated the market. During this time, some had said Buffett had lost touch. Well, Buffett got the last laugh and from 2000-2007 Berkshire went on to produce a total return of 152% while the S&P returned 14%. It’s one thing to see a 20.6% compounded return. It’s another thing to see it in in the form of how actual investment dollars compound over time, and this might be the most valuable lesson to draw from looking at Berkshire’s returns. A $10,000 investment in Berkshire in 1965 would have been worth a little over $1 million in 1983, $13 million in 1993 and $143 million in 2013. As of the end of 2018, it would be $247 million, equivalent to a 2,466,381.87% return. The point of all this isn’t just to marvel at Buffett’s returns, although that is fun to do, but instead to gain insight into how the performance of the greatest investor of all time played out and what we can learn from that. 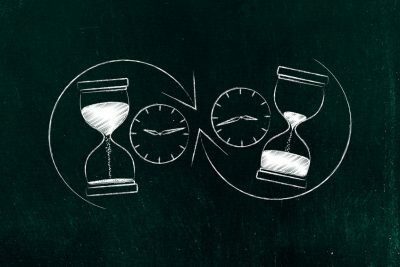 These lessons include taking a long-term view, understanding the power of compounding, realizing that even the best strategies and investors will often underperform the market, and knowing that to beat the market you have to look different. Learning those lessons probably won’t allow you to generate the returns Buffett did, but it will make you a better investor.